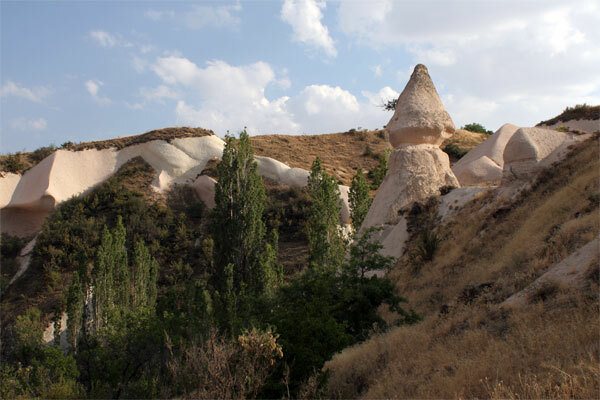 Here are some shots from Göreme in the Cappadocia region of Turkey, where castle rocks abound, and for centuries people have carved churches, homes and now pension rooms into the conical rocks. 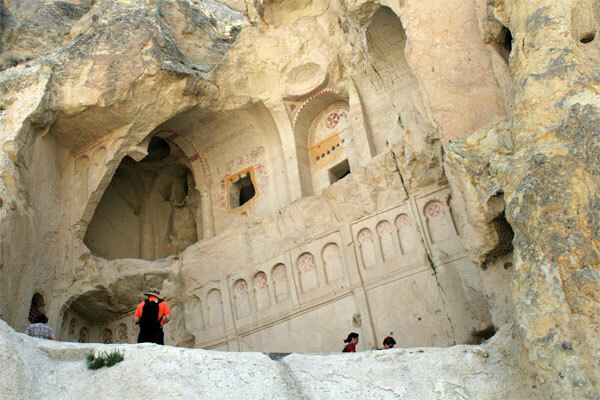 After arriving at dawn on an overnight bus yesterday, I spent the morning meandering among the rock-hewn Byzantine churches of the Göreme Open-Air Museum. 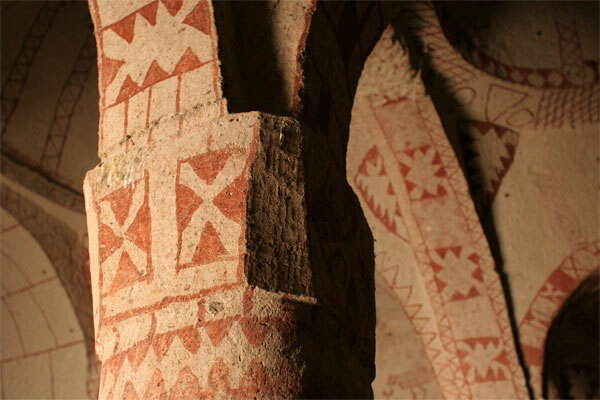 There, dozens of rooms, among them churches, chapels, monasteries and dining halls, were cut into the stone of the chimney rocks, and frescoes were painted on the walls, ceilings, columns and arches. The area had been the site of Christian monasteries and the home of bishops since the fourth century of the Common Era, but most of the brighter frescoes date from the 11th century. 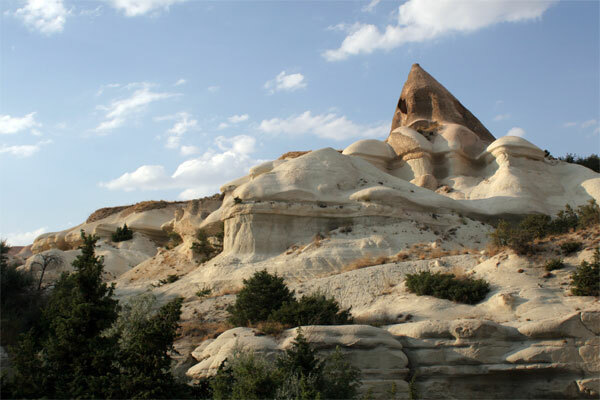 My favorite was the church dedicated to St. Onuphrius, an ascetic who lived in Egypt and whose dedication to religious meditation and removal of all comforts of human life inspired one of the benefactors of the Göreme churches. A fresco of Onuphrius, with a palm frond protecting his modesty, is on the ceiling by the doorway, opposite a scene of Saints George and Theodore attacking a dragon. 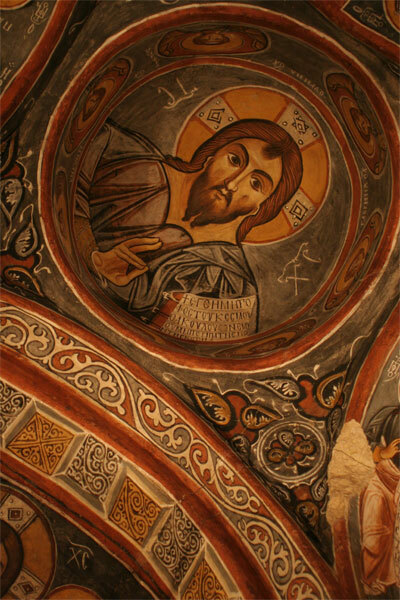 The most impressive remaining frescoes (many have been vandalized over the years), are in the so called Dark Church. Here, scenes of the life and death of Christ are crafted in vivid colors, with dominant dark blues. 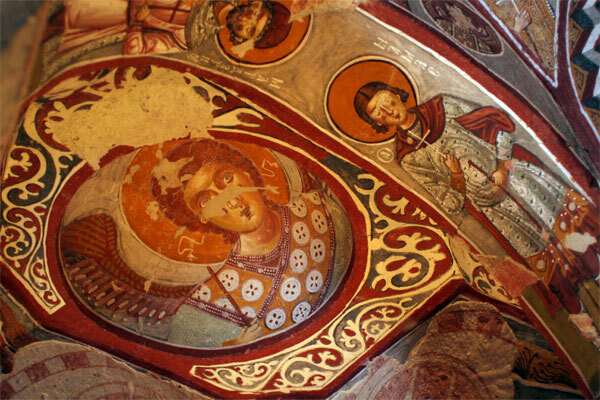 It’s said that the lack of windows protected the frescoes, so the colors haven’t faded. It’s one of the churches at the open-air museum that has had extensive restoration, and the work has clearly paid off. I’m staying in a little pension overlooking the town of Göreme, which has similar cone formations to the churches at the open-air museum, many of the chimneys are now turned into tourist lodging (I can hear a jackhammer whittling out a new room as I write this). I didn’t spring for the extra cash to stay in a cave (never been much for the troglodytic life), but I have a comfortable room with windows over a quiet alleyway and stone arches over my bed. In the afternoon, I took a long walk to a place called Zemi (Love) Valley, with a spectacular view across the landscape. The path to the site was a rugged trail at the bottom of a canyon, and involved some scrambling. On the walk back, I found a wider path among vineyards and pumpkin patches that rose above the canyon and put me back at the top of Göreme in half the time. My goal this week is to hike at least four hours a day and to catch up on sleep. Looks like there’s plenty of opportunity here for both.